Portable solution to fine surface spraying, this product is ideal when on the go due to its easy transportation. 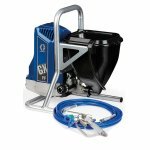 Graco GX FF Portable Airless Sprayer is a new and portable solution to fine surface spraying, this product is ideal when on the go due to its easy transportation features, such as the handle and lightweight machine. The machine has a lid which helps when lifting up as its job is to prevent the spillage when carrying the machine. These are the other features of this machine. 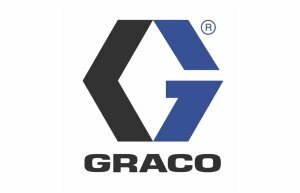 This machine has the Pro-X Piston Pump technology, this combines with the Gracos proven piston with the RAC fine finish switch tip which allows the smooth finish. ProxChange Pump allows an easy change over of pumps without any tools required. 1.5 Gallon hopper makes the machine ideal for spraying small amounts of material which allows a smooth inside surface which cleans up fast, there is a lid which covers the hopper helping with making it sealed to prevent spillage. The Hopper is easily attached and can be done without any use of tools, this enables this to then be cleaned up fast.